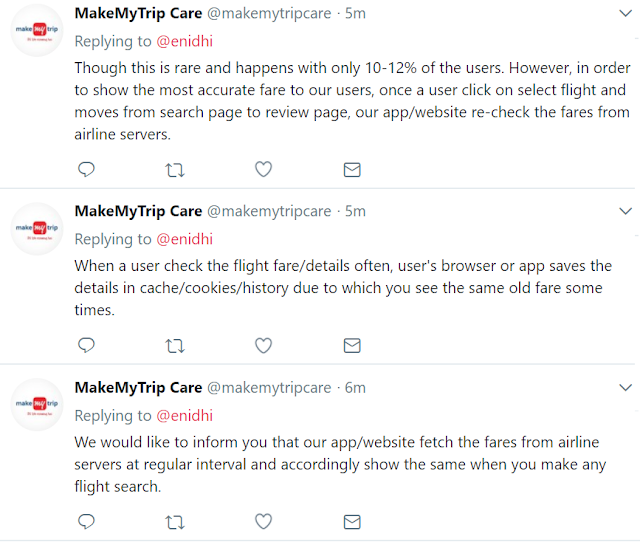 Home / india / issues / tips / Beware of MakeMyTrip's latest trick! Count on MakeMyTrip to find more n more innovative ways to trick unsuspecting customers into paying more money. I have already written earlier about their misleading ads. The latest trick they've rolled out is the fare update after you select a flight. When you want to book a flight ticket, in all probability you will open 3-4 top websites like MMT, cleartrip and few others and see who is showing cheapest fares. Once you zero in on which website to book, you will proceed to complete the booking, without cross checking and comparing the fare at every stage of the booking process. 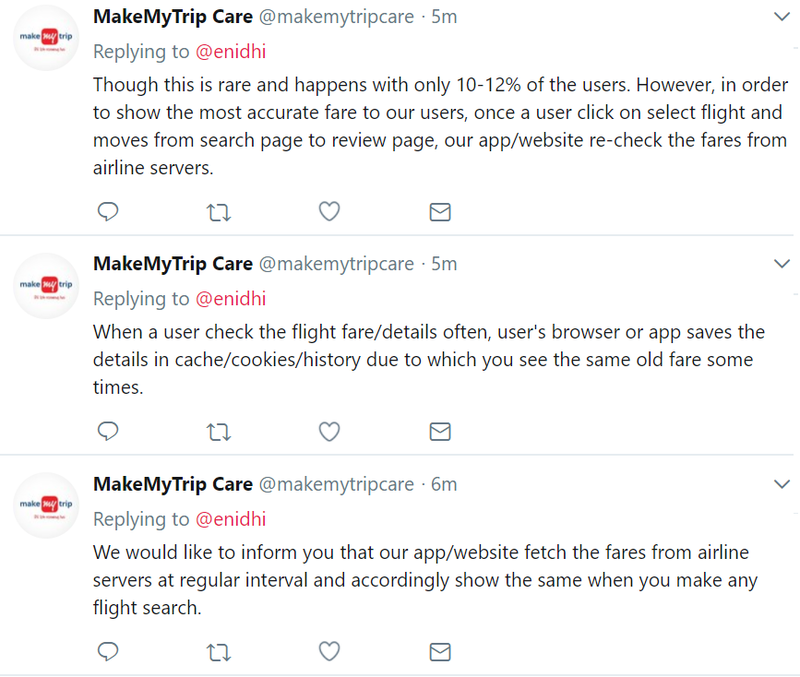 MakeMyTrip seems to have devised an evil strategy to trick customers- show lower price in first screen, make customers chose MMT over other sites and increase it in next screen. Note the time- 9.38 AM. 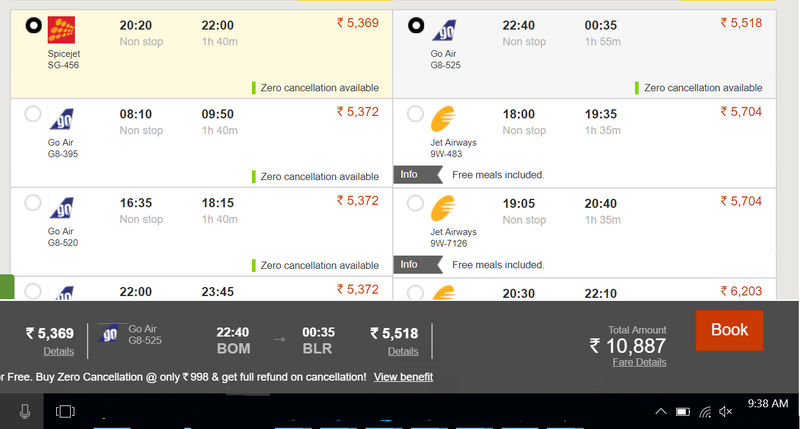 I select a direct flight between Bengaluru and Mumbai and return fare is 10887 Rs. I am mentally prepared for a convenience fee of Rs 200 per person per flight as well, but what happens in next screen is a real shocker! Next screen, make my trip temporarily shows "Rechecking fare". Note that already total amount has gone up by 254 Rs due to makemytrip service charge and donation. We will compare it with cleartrip or other sites for first page- once we decide and start booking process we don't keep comparing again and again. Makemytrip is trying to exploit this process by increasing price after showing lower prices in first screen. Now, yes, it is possible that at times fares change. Airline fares are very dynamic.We can't help. But the proof of MakeMyTrip's cheating comes from a fresh search. Note the time below- 9.41 AM. I did a fresh search. If the fares had really increased, now I should be seeing 12250 something as the fare for same flights. No. I am still seeing old price. 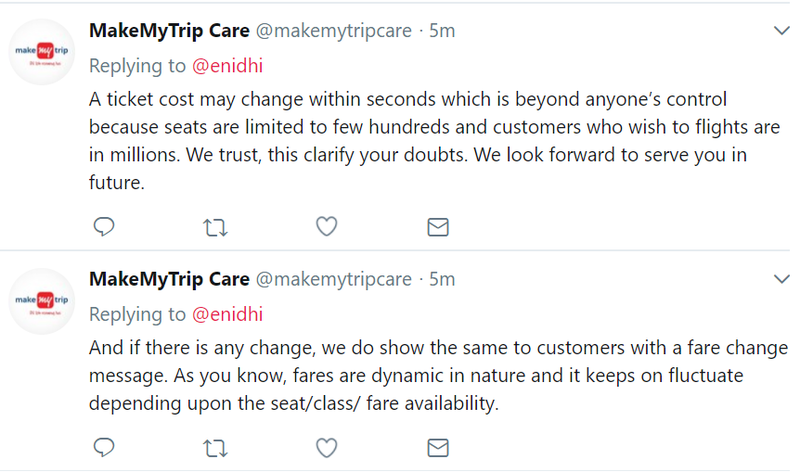 This implies the intermediate price increase induced by makemytrip is deliberate, artificial and malicious. Most customers will either miss to notice this fare hike or will assume it is genuine and continue with booking. But when it gets spotted by some over curious and hyper sensitive people like me, it ends up as a blogpost, alerting more people about this trick. 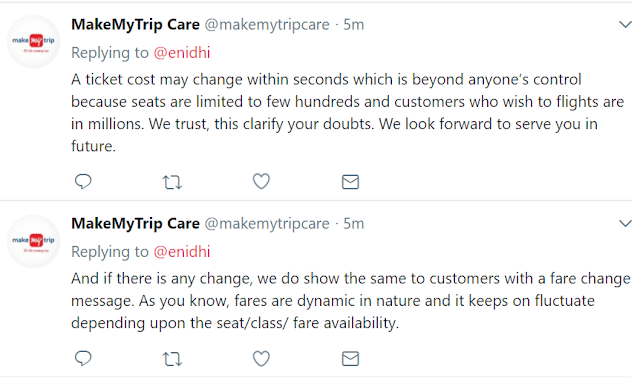 MakeMyTrip's twitter team has responded as below. They claim it is a genuine process. I repeated above process in incognito mode, got same behavior. And this behavior seems unique to MMT right now- few competitor website aren't behaving same way. If it happens only once in 10 tries may be you can ignore this phenomenon, but if it happens almost all the time, you need to be careful. Please use your discretion. As observed at the time of preparing this post. Website behaviors may change over time. Please use your discretion. Below is a tweet that shows a massive 2.5 lakh increase in price. Hard to believe such an increase is natural. Yes, they've been doing this for a long while. It is ok. I prefer to write honest, truthful n useful content. If some brands don't like it or me in the process I can't help. Thanks Shrinidhi, this is really helpful. But would you advise booking directly from the airline's website? I tried that for a guwahati trip and got the best fares on the indigo site. Yes, booking direct is usually cheaper, as OTAs get near zero margin on tikcets hence are forced to rely on service charges and other additional revenues. Also cancellation/modification will be cheaper if done on airline site. Classic case is how they have not refunded ADF of million of flyers from delhi and kept it under carpet for themselves .. Per ticket per pax approx INR 500 and no body cares about it ..
Make my Trip is surely on a cheating trip. They haven’t refunded the money refunded for my cancel tickets. Recently I have booking tickets for my leh trip through Goibibo,while checking out I thought of getting a travel insurance.But I felt I can get it after booking my tickets. I contacted Bharati Axa insurance for getting trip insured, But they said they don't have any policies for insuring domestic travels. Then how come these websites offer insurance for domestic travel????? Ohh yeah thanks for sharing this valuable information from next time I will always use cleartrip for booking flight tickets and hotel bookings.